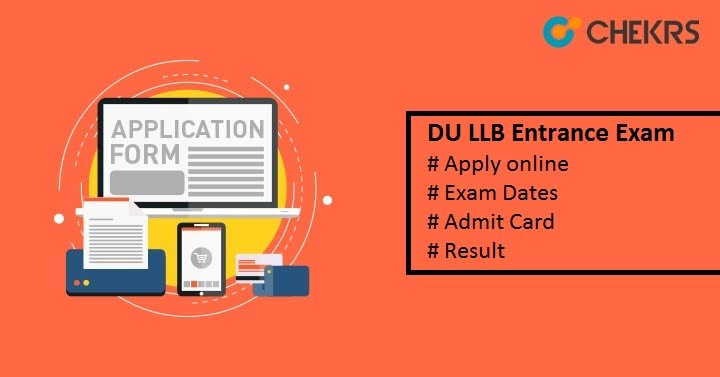 DU LLB Entrance Exam 2019: DU LLB Entrance Exam is a University level in which an Interested Indian candidate can apply for it. The Entrance exam is being conducted by Delhi University to shortlist students for admission in 3 Years LLB programs. DU Colleges which accepts DU LLB Entrance exam Scorecards are Campus Law Centre, Law Centre-I, and Law Centre-II. A total of 2650+ seats are being offered through this exam. The DU LLB Admission Form will be released in the 2nd week of June 2019. All other details are provided in this article. The application form is expected in the 1st/2nd week of June 2019. And it will be available till the 4th or last week of the same month. 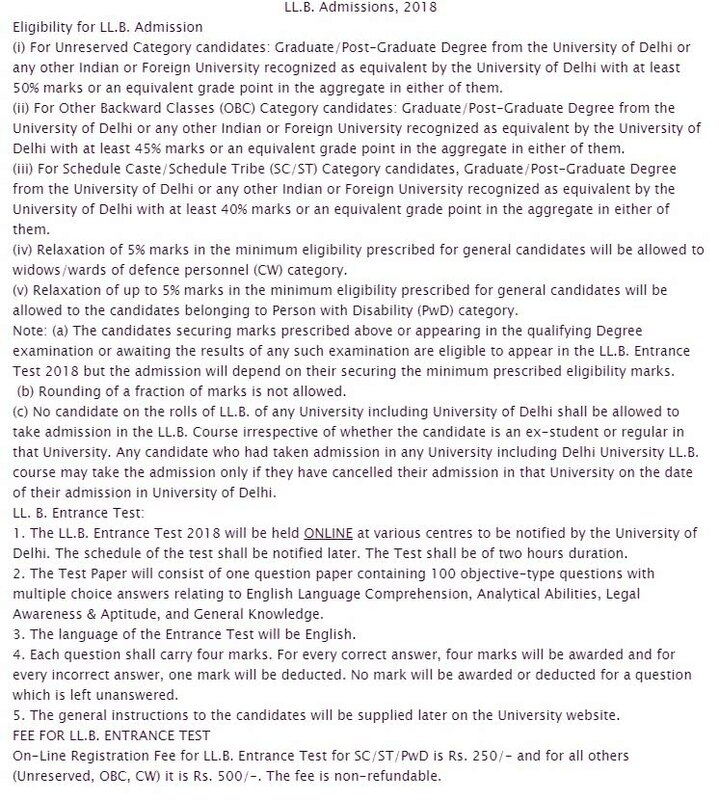 Delhi University LLB Entrance Exam Dates will be informed with the official notification by the official authority. Candidates have to fulfill all the DU LLB Eligibility Criteria. Candidate’s DU LLB Application Form will be rejected if he will be not eligible for the exam. Some of the basic eligibility criteria are listed below. Graduation degree in any stream from DU or any other recognized institution/university. With 50% marks for general category candidates, 45% marks for OBC category candidates & 40% marks for SC/ST category candidates in their qualifying exam. Students appearing in final year of graduation are also eligible. 2. There is extra 5% relaxation in qualifying marks for widows/wards of ex-servicemen/CW & Physically Handicapped (PH). 3. There is no upper age limit to appear. The Registration or Application Form will be released in online mode only. DU LLB Admission Form 2019 is expected in the 1st/2nd week of June. And it will be available till the 4th or last week of the same month. After it Login to the side by using login details and move to DU LLB Application Form. In Application form, enter Personal, academic and Contact Details. After it Checks all the details and takes a print out of filled application form and preview before submission. Candidates can pay the DU LLB Application Fee through online and offline mode. Through Online Mode they can pay using credit card/ debit card/ internet banking an in Offline mode payment can be made via NEFT/ Demand Draft. For Better Preparation you need all the basic details of DU LLB and hence we are providing basic exam details here. Starting with DU LLB Exam Pattern. The exam authority will release Delhi University LLB Syllabus pdf on the official website. So follow the given syllabus. However, the syllabus will consist of following subjects/topics. DU LLB Admission Admit card will be released on the official website in last week of June. Hall ticket will be also required at the examination center for candidate verification. So make sure to carry the admit card with a photo id to the examination center to make thing easy for yourself on the exam day. Candidates need to go to the official website and enter your Application number or DOB to access and download the DU LLB Hall Ticket. DU LLB Answer Key will be released in next few days after the exam. Candidates can download the answer key from the official website. Candidates can also estimate their marks by adding 4 marks for each correct answer and deducing 1 mark for their each wrong response. Appeared candidates can also raise the objection if they found any mistake in The Answer key. The Result will be declared online on the official website. All they have to enter asked details to access DU LLB Entrance Exam Result. After the result declaration candidates have to visit the official website and they have to find the result link there. Separate Merit/rank list for overall marks, Category wise, and Ranks will be released by the exam authority on the basis of DU LLB Cutoff Marks 2019. 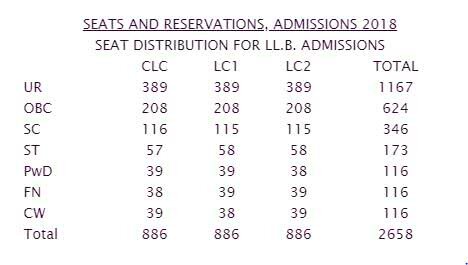 2650+ seats are being offered through the DU LLB Admission. The Admission will be done in Campus Law Centre, Law Centre-I, and Law Centre-II. The basic Seat Matrix and Reservation on Seats are given below. There will be no major changes in it. The Counselling will be organized in the university campus. It is expected to be started from the month of July 2019, Last week. Qualified Candidates will be allowed for the Choice Filling. On given time and date. Candidates also have to pay the counseling fee. After It, Seat will be allotted to the qualified students on the basis of their Rank list, Performance, Category, seat availability, and reservation. Hence the Admission will be Provided to the eligible and qualified Candidates.